African sapphires: A collection of seven fancy sapphires from Africa. Several countries in eastern Africa have recently become spectacular sources of beautifully colored sapphires. The top photo was taken using the Olloclip 15x macro lens. The bottom photo was taken with the iPhone without using a supplemental lens. When the photo was taken, the iPhone was as close to the subject as possible. If the iPhone was moved any closer, the lens would not produce a clear focus. These photos show the benefits of the macro lens. Take a look at the pair of sapphire photos on this page. They show the impact of adding a simple macro lens to a standard cell phone - in this case an iPhone 5s. 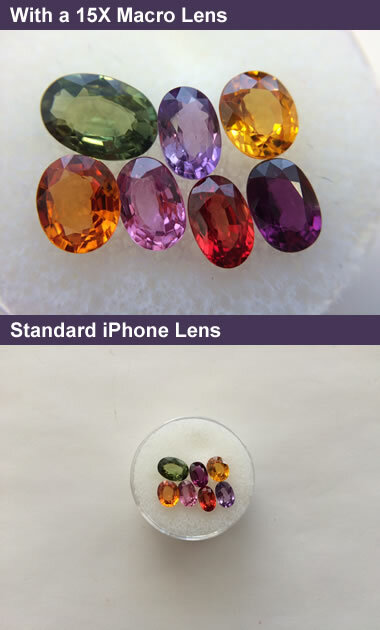 The top photo of seven African sapphires was taken using a 15x Olloclip macro lens that slips over the top of the iPhone without the use of tools. The bottom photo was taken of the same subject but without the macro lens. Both photos were reduced to 380 pixels wide to fit the format of this website. If you want to see the top photo in its full glory, just click here. Wow! The collection of 8 thumbnail photos below on this page were also taken with an iPhone 5s and supplemental Olloclip 15x lens. Click on the letters in the description to see the full 8-megapixel images. 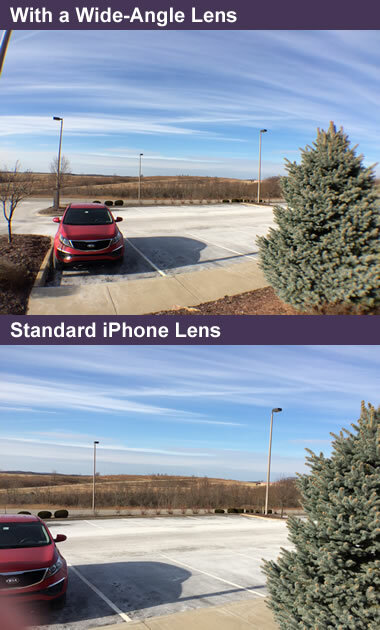 We think that the results are spectacular for simply slipping a $79 lens over the iPhone lens and shooting without any supplemental lighting. None of the photos have been edited for color and contrast. Now do you see what you are missing if you don't use a supplemental lens? You missed the fingerprints on the gems, a few pieces of lint that are clearly in focus, and a few tiny flaws in the gems that are otherwise pretty close to "eye clean." The detail that you can capture in a cell phone photo is amazing! In the past decade, many people who work in the field or in a laboratory have learned to depend upon their cell phone camera for photos. Cell phone cameras have been an enormous convenience because you don’t need to carry a separate camera. More importantly, the cell phone allows you to immediately share your observations and questions with just about anyone in the world who is connected to the internet (provided that you have connectivity as well). Cell phone cameras are getting better all of the time, but it is still possible to significantly improve your photos with inexpensive lenses. A number of companies offer single lenses and lens kits. We decided to buy a lens kit that would allow us to take close-up and wide-angle photos. Olloclip lens kit: Photograph of the Olloclip lens kit when not attached to the iPhone. The wide-angle lens is on the right and the fisheye is on the left. The black portion is hollow and has an opening on the back side that slides over the top corner of the phone as shown in the photo below. We recently purchased and experimented with the Olloclip 4-in-1 Lens for the iPhone 5 / 5s. It is an attachment kit that fits your iPhone with two macro lenses (10x and 15x), a fisheye lens, and a wide-angle lens. The cost was just $79. Similar kits are available for the iPhone 6 / 6 Plus, 5c, 4 / 4s, iPad, and Samsung Galaxy S.
The photos here provide you with a good view of the lens kit when not attached to the phone and in two modes of use on the iPhone. The device simply slides over the corner of your phone where the camera lens is located. No tools are needed. The only downside of the lens is that it must slide onto the bare corner of the phone. In other words, if you have your iPhone in a protective case, you will have to remove it to take photos. Once we learned how our Otterbox case works, we were able to remove it or replace it in under one minute each way. 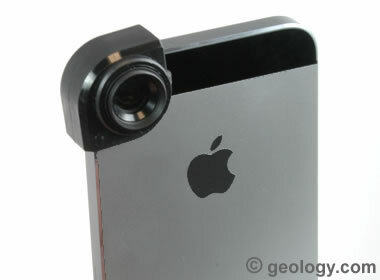 If you don't want to do that, Olloclip sells a small case with a corner that flips up to accommodate the lens. 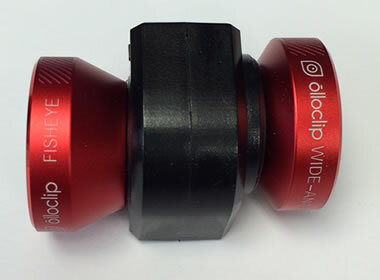 Olloclip wide angle and fisheye lenses: Olloclip lens kit fitted on an iPhone 5s. The kit simply slides over the corner of the phone to cover the camera lens opening. No tools are needed to install or remove the kit. The only downside is that the lens kit cannot be used when the iPhone is in a protective case. We purchased an Olloclip case for $39 that provides less protection than our Otterbox case but has a corner that flips up to allow quick installation of the lens kit. 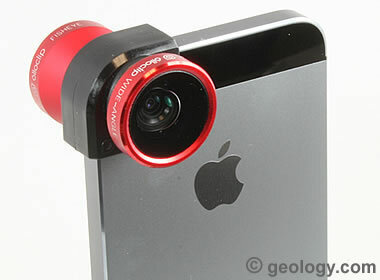 Olloclip macro lens: The red wide-angle and fisheye lenses simply screw off to expose the 10x and 15x macro lenses. The kit includes protective lens covers to protect these lenses when they are not in use. Photos taken with the macro lens: Eight photos taken with the 15x macro lens. Click on any of the letters below to see a higher resolution view (the tourmaline-emerald pegmatite is highly recommended). 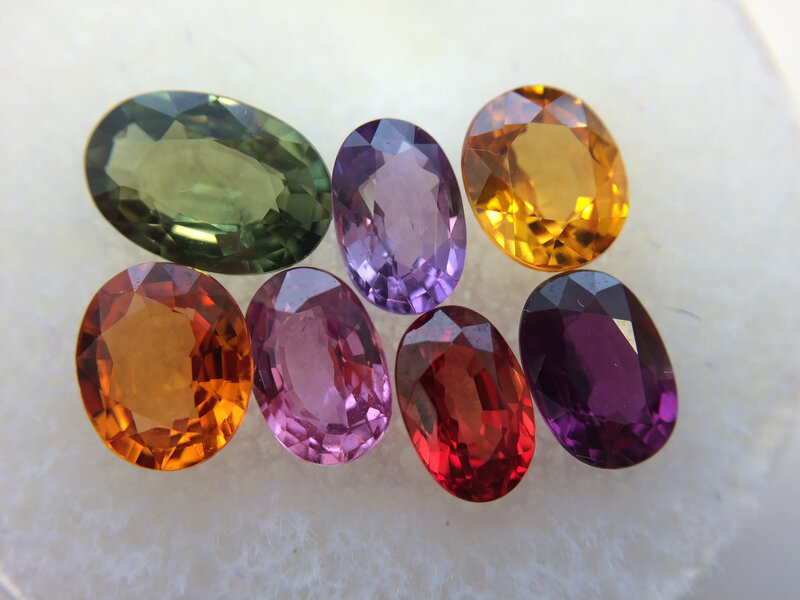 Starting at the top left and going clockwise: A) Seven African sapphires. The pink one in the bottom row measures 6x4 millimeters in size. 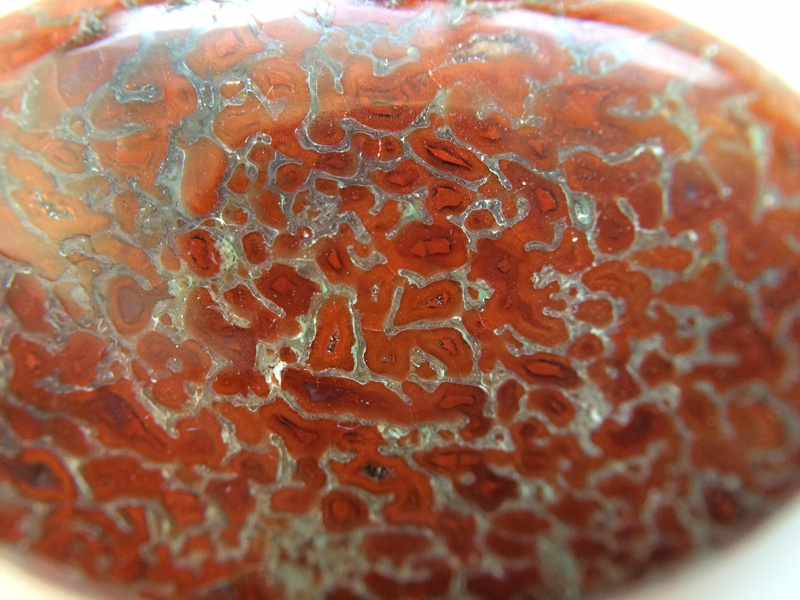 B) The surface of a cabochon cut from dinosaur bone showing the cell structure of the bone. The width of this image spans about one centimeter. 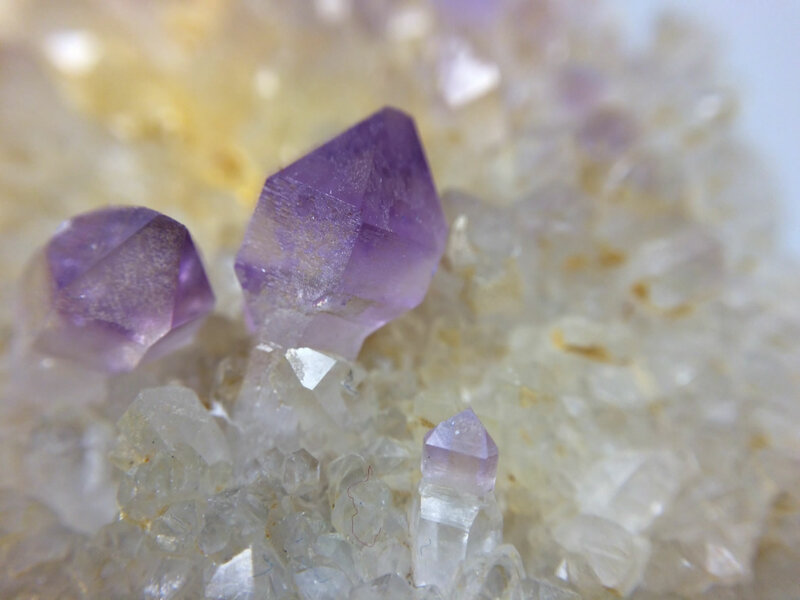 C) A tiny amethyst crystal with color zoning, from the Saltman Prospect in Oxford County, Maine. The crystal is about one centimeter wide. 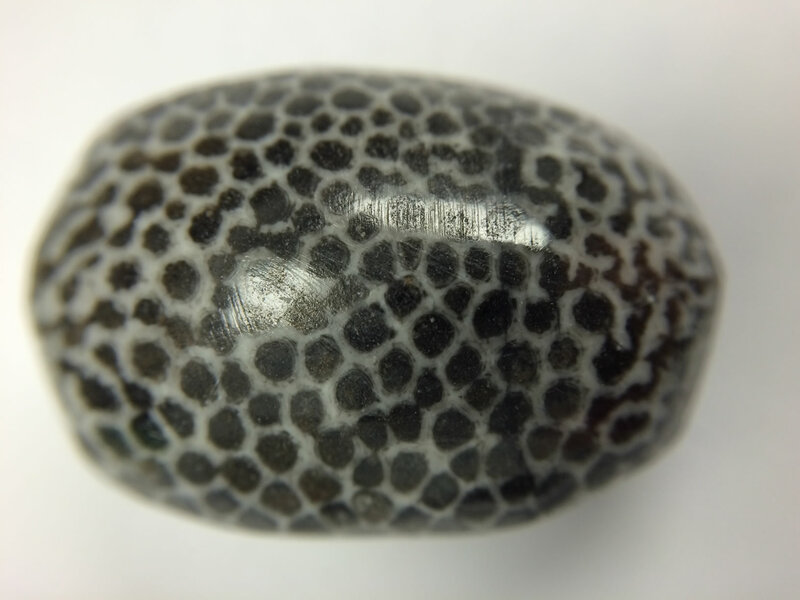 D) The surface of a tumbled stone displaying the structure of a fossilized bryozoan. The view is approximately 1.5 centimeters in width. 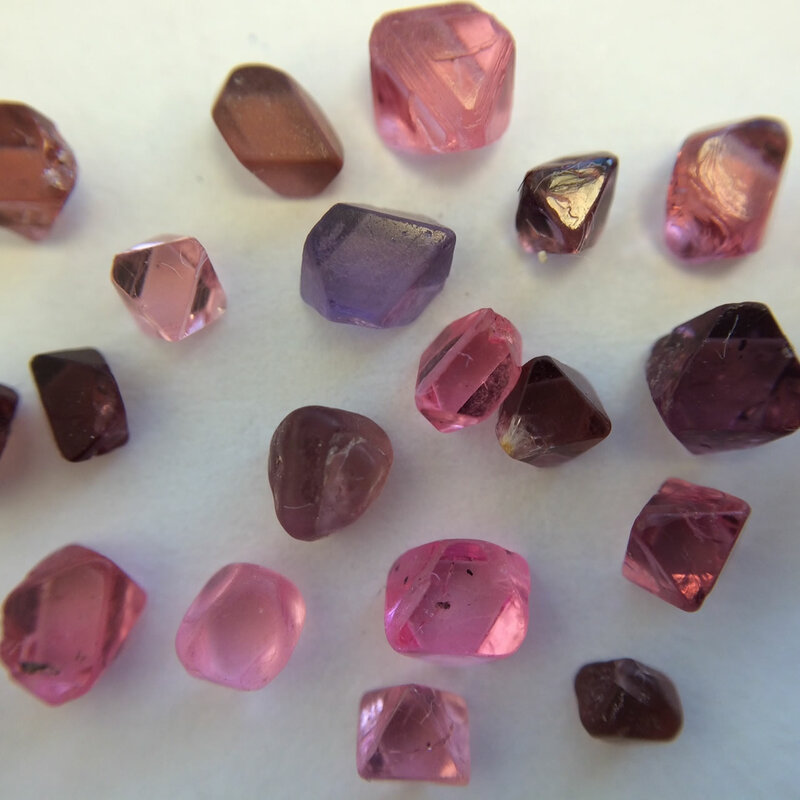 E) Tiny spinel crystals from an alluvial deposit in Vietnam. The crystals range between 3 and 5 millimeters in size. 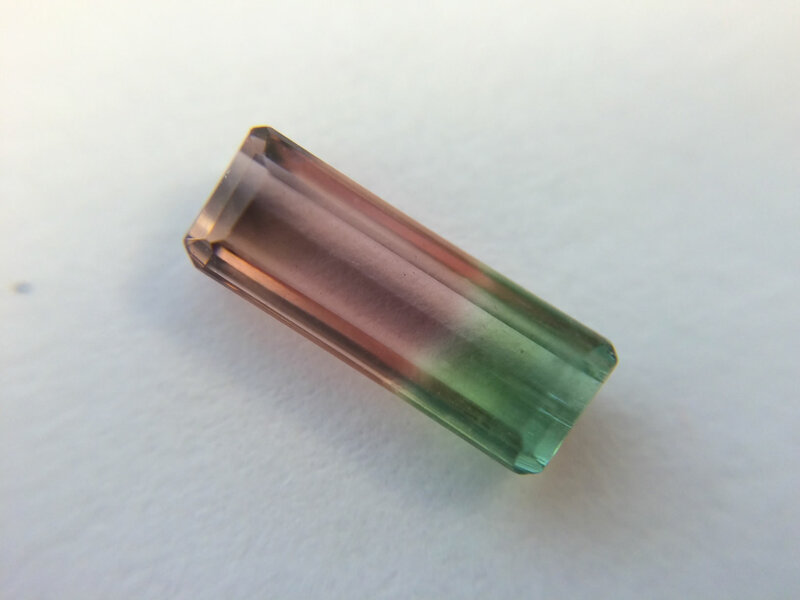 F) A faceted rectangle of bicolor "watermelon" tourmaline about 3 x 8 millimeters in size. 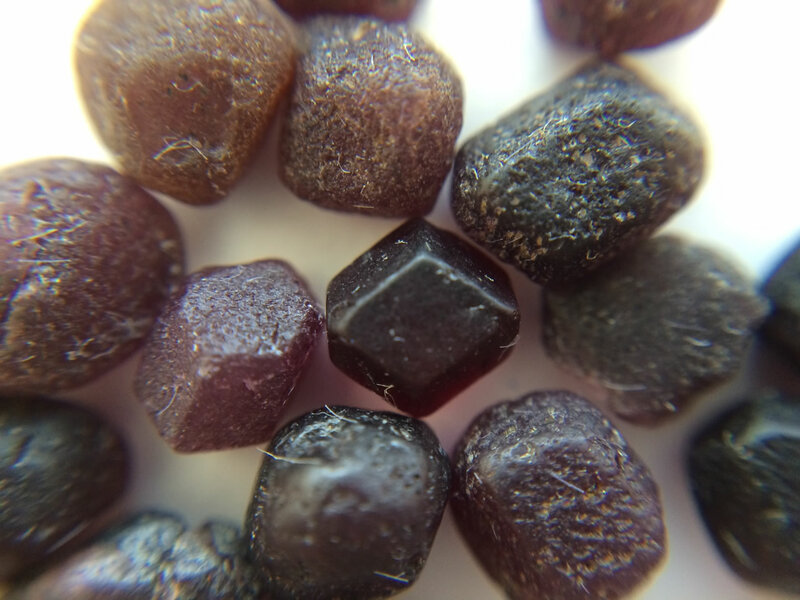 G) Several almandine-spessartine garnets from an alluvial deposit in Idaho that still show evidence of their original dodecahedral form. The crystals are between 4 and 5 millimeters in size. 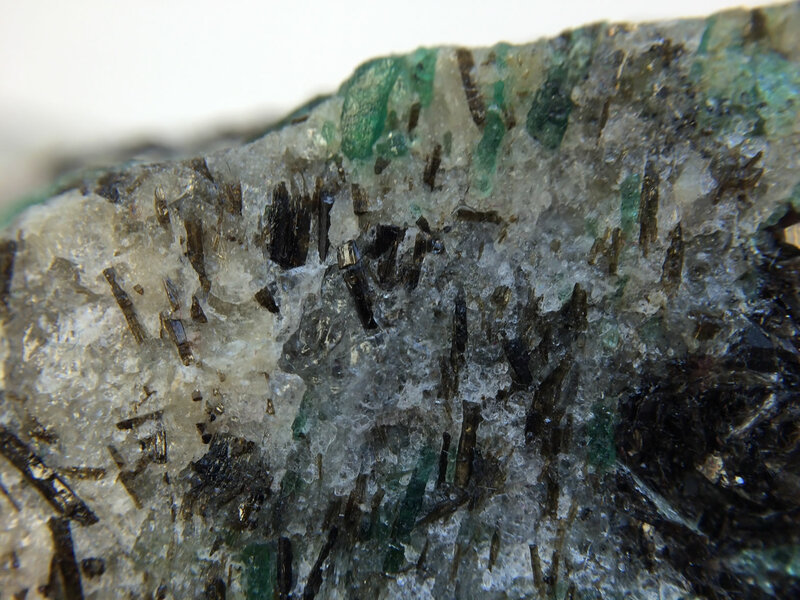 H) The edge of a piece of the Crabtree Pegmatite showing tourmaline and emerald crystals from western North Carolina. This view is about 1 centimeter wide. These photos were taken with no supplemental lighting, and no editing at all was done to improve contrast or color. The Olloclip kit that we purchased includes 10x and 15x lenses. We found that they work extremely well and gave great magnification compared to what you can see with an iPhone alone. The 15x lens is powerful enough to show tiny details in sedimentary rocks, inclusions in gemstones that are not eye-visible, and striations on sub-millimeter tourmaline crystals. The iPhone that we used has an 8-megapixel camera. When we displayed the photos at full resolution on a desktop computer screen, the apparent magnification level greatly exceeded 15x with great color and clarity. 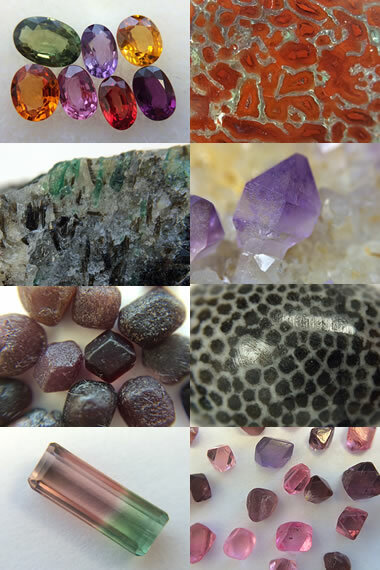 Many of the photos displayed on Geology.com and on our RockTumbler.com retail website were taken using an iPhone and an Olloclip without using any supplemental illumination and without applying any color and contrast editing. Wide-angle lens comparison: A pair of photos that demonstrate the usefulness of a wide-angle lens. The top image was produced with the Olloclip wide-angle lens, and the bottom was produced with the standard iPhone lens. You can see that the wide-angle lens captured a wider and taller field of view. It is approximately equivalent to backing up a significant distance and taking the photo. Below on this page you will see a pair of photos that demonstrate the wide-angle lens. The wide-angle lens enables your camera to capture a wider and taller field of view. It is approximately equivalent to moving a significant distance away from your subject. These can be great for outcrop photos, landscape photos, and photos of geology field trip participants. The wide-angle lens has no adjustments. However, if the view is too wide or too tall, you can easily crop as needed in a photo editing program. That is actually one of the best ways to get nicely composed images. We felt that a supplemental lens kit for the iPhone was a great investment at only $79. The macro lens enables the photographer to capture details that are too small to photograph without a supplemental lens. Tiny crystals, sedimentary structures, grain surface textures and more are all possible to capture. The wide-angle lens enables you to take photos of outcrops and landscapes from a closer distance. Sometimes it is impossible to capture these images from a greater distance because your back is against a river, the opposite side of a roadcut, or trees that will block your view if you move farther away from the subject. With a surprisingly small amount of practice and a willingness to shoot a number of practice photos, you might be able to capture publication-quality images in the field or laboratory without purchasing or carrying an expensive array of camera equipment. Although we used an Olloclip lens kit for this article, there are many other lens kits for the iPhone and for most popular cell phones from other manufacturers. If you own almost any popular brand of cell phone, you should be able to improve many of your photos with an inexpensive lens kit.